All transactions are safe and secure with a reliable history in online purchasing behind each of our associates. Buy The Sopranos Family Cookbook to own Sopranos clothing and merchandise. 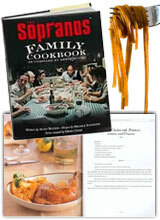 If you love Italian food, The Sopranos Family Cookbook will have your taste buds saying, "Bada bing!" Packed with a hundred recipes and tips, Artie Bucco (John Ventimiglia), who portrays a chef on the TV show, guides you through the Avellinese themed recipes. From Pasta Fazool, Marinara Sauce and Cannoli to grill time family favorites, show your loved ones that you don't have to be a gangster to know how to cook, it just helps to learn from them. In addition to The Sopranos Family Cookbook above, browse the Sopranos Clothing Gallery for more apparel like men's and women's clothes, kids shirts or hoodies.